Safety is part of our culture, why not Sustainable Procurement too? What if Sustainable Procurement were to become part of our culture at work, home and school, just as safety is now? I see Sustainable Procurement as the process of improving the efficiency by which public sector (i.e. Government) money is spent whilst at the same time using influence to bring about major environmental and social benefits locally and globally. It is the process of sourcing and procuring goods, services, and even construction projects, taking into account the social, economic and environmental impact on communities, and still delivering value. Public sector procurement is central to delivering the social, economic and environmental benefits that sustainable economic growth demands. It is vital for organisations to develop specific plans in alignment to their corporate sustainability policies and establish specific procedures along with measurable key performance indicators to promote the procurement of sustainable goods and services. In the eyes of citizens and residents, we all want to see a commitment to ensuring that any public sector spending derives value for money and contributes to sustainable economic growth for our country. Sustainable procurement is simply good procurement; it is the right thing to do and has to have a recognised role within a balanced approach alongside improved quality and optimised costs. Procurement: On the Brink of Relevancy? We're back! 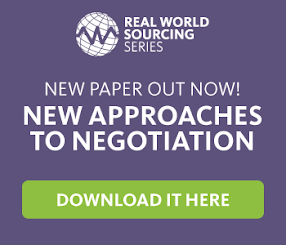 The 2014 Real World Sourcing Series.